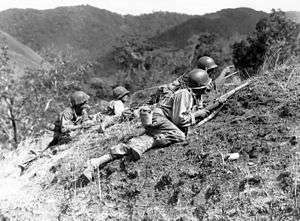 U.S. troops approaching Japanese positions near Baguio. 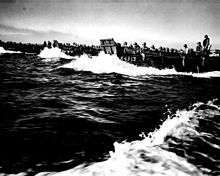 The Battle of Luzon, fought 9 January – 15 August 1945, was a land battle of the Pacific Theater of Operations of World War II by the Allied forces of the U.S., its colony the Philippines, and allies against forces of the Empire of Japan. The battle resulted in a U.S. and Filipino victory. The Allies had taken control of all strategically and economically important locations of Luzon by March 1945, although pockets of Japanese resistance held out in the mountains until the unconditional surrender of Japan. While not the highest in U.S. casualties, it is the highest net casualty battle U.S. forces fought in World War II, with 192,000 to 205,000 Japanese combatants dead (mostly from starvation and disease), 10,000 American combatants killed, and between 120,000 to 140,000 Filipino civilians and combatants killed. ↑ Escuadrón 201, a Mexican fighter–bomber squadron that participated during the last phase of the battle. ↑ "Luzon" Retrieved 25 Oct. 2015. 1 2 3 4 5 "Luzon 1944–1945". Archived from the original on 15 December 2008. Retrieved 6 December 2008. 1 2 "The Philippines". Archived from the original on 22 February 2009. Retrieved 6 December 2008. 1 2 3 C. Peter Chen. "Philippines Campaign, Phase 2". Archived from the original on 15 December 2008. Retrieved 6 December 2008. 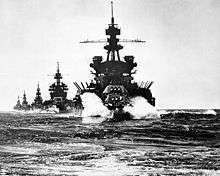 ↑ "The Battle Of Luzon Compared With Other Battles Of World War II". Retrieved 6 December 2008. ↑ "Target: Luzon". Time. 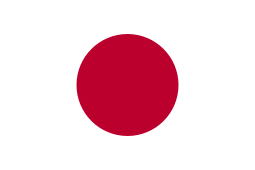 15 January 1945. Archived from the original on 15 December 2008. Retrieved 6 December 2008. ↑ "The Guerrilla War". American Experience. PBS. Archived from the original on 25 February 2011. Retrieved 24 February 2011. ↑ 93,400 American soldiers fell sick during the campaign, although most were quickly cured and returned to duty. Except for the 260 who died, these troops are not listed in the total. Smith, Robert Ross (2000) . "Luzon Versus Formosa". In Kent Roberts Greenfield. Command Decisions. United States Army Center of Military History. CMH Pub 70-7.